Welcome to All Sensors “Put the Pressure on Us” blog. This blog brings out pressure sensor aspects in a variety of applications inspired by headlines, consumer and industry requirements, market research, government activities and you. In this blog we’ll look at pressure sensing and how it improves HVAC efficiency. Clean air in heating, ventilating and air conditioning (HVAC) systems requires filtering to eliminate dust, pollen and other airborne contaminants in residential, commercial and industrial buildings for the health of occupants and equipment. Some locations such as clean rooms in semiconductor and other manufacturing operations as well as hospital operating rooms and research laboratories have very special requirements. Clean air depends on the filter’s initial efficiency and the pressure drop across it, which increases with usage. The pressure drop is also called the air filter resistance. Filters are rated in static pressure at a specified cubic feet per minute (CFM) air flow. In 103 – Filtration Fundamentals, one company states that most heating /cooling systems in the residential and light commercial markets are designed to move 900 CFM to 2000 CFM at a total system static pressure of approximately 0.5″ to 0.7″ total pressure drop including the resistance through the ductwork and the filter. With usage, the total pressure drop increases causing the filter to draw more power and increase the stress on the air handling equipment. 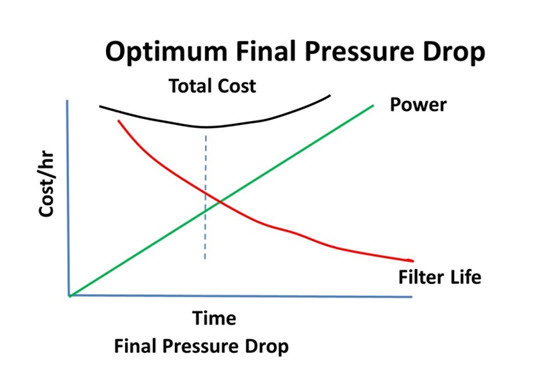 The point where the pressure drop increases the electrical power consumption and overtakes the initial cost of the filter indicating that a filter change is required is called the optimal change-out point and is shown in Figure 1. Figure 1. The optimum final pressure drop across an air filter. Achieving the optimum performance leads to efficient filter operation and safe, clean air.